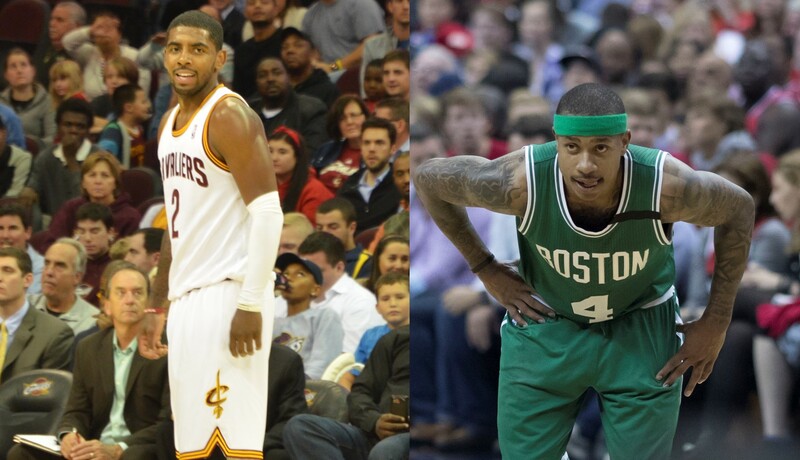 A change of guard – The Cavs and Celtics traded their star point guards earlier this morning. Earlier today, in a move that no one saw coming, the first pick of the 2011 draft class was traded for the last pick of the same draft class. The Cleveland Cavaliers traded their superstar point guard Kyrie Irving to their Eastern Conference rivals – the Boston Celtics for their 5’9″ guard, aka Mr. Fourth quarter, Isaiah (this is the correct spelling) Thomas, Jae Crowder, 20-year-old Croatian international Ante Zizic and Brooklyn’s 2018 unprotected first round draft pick. The trade is a win-win for both sides involved as Celtics, in Kyrie Irving, get themselves a proven, championship calibre player who has arguably made some of the biggest shots in recent NBA history. While the Cavaliers set themselves up well for their uncertain future without losing out on contending for the championship in the present. The Celtics get arguably the best one-on-one scorer in the NBA who has the knack of knocking down the big shot when called upon. Kyrie Irving’s scoring prowess, if not exceeding, then at the very least is on par with their former point guard. Irving’s defence is rather under rated and has steadily improved, which is an upgrade for the Celtics over Thomas – who is a liability on defence. The trade also ensures that the Celtics have their current star players (Gordon Hayward and Irving) locked up in multi-year contracts. An under-rated factor or rather overlooked factor of the trade are the intangibles that Irving brings to the table. A frequent criticism of the teams in the East is the lack of grit/competitiveness while going up against a LeBron-led team. The Celtics address that issue with their latest addition who definitely is known around the league as a fierce competitor and perhaps is the most motivated to prove a point to his former teammate. 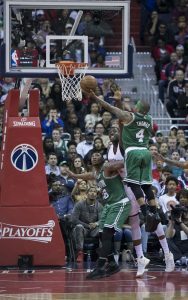 Isaiah Thomas with the finish at the rim. makes sense). The Cavs will not miss a beat on the offensive end as Isaiah Thomas is known for putting up big numbers and will effortlessly fill up the scoring void left by Kyrie Irving. The addition of Crowder – a 3-and-D guy – is good news for Lebron James who now does not have to be the primary defender on opposing small forwards (hint: Kevin Durant). Ante Zizic is a solid prospect out of Croatia and his development over the years will only make this trade sweeter for the Cavs. Perhaps, the most important part of the trade is the coveted 2018 Brooklyn’s unprotected first round pick which is expected to be a top-3 pick (based on Brooklyn’s performance, which we all know is going to be abysmal). If King James decide to bail on Cleveland again, the Cavs are very well positioned for the rebuild as the 2018 draft class boasts of players such as Michael Porter Jr., Marvin Bagley III and Luka Doncic, who are solid young studs to build a franchise around. Add to the mix the expiring contract of Isaiah Thomas, who the Cavs will most likely not re-sign, only helps their rebuild cause. In Kyrie Irving, the Celtics receive a score-first, ball dominant, point guard who may not fit as well into the ‘Brad Stevens’ brand of basketball. 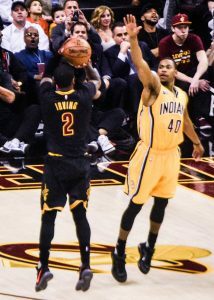 Irving may have made significant strides on defence, however is far away from being the on-ball stopper that every team requires at the guard position. While Isaiah wasn’t necessarily a great defender himself, he had the luxury of playing alongside defenders like Bradley and Crowder who often took on the toughest guard assignments on the defensive end – a luxury Irving doesn’t enjoy (Bradley was traded to the Pistons earlier this off-season). While the Cavaliers secure their future and answer their immediate defensive woes, they lose their primary, and arguably their most consistent scorer, in Kyrie Irving. While the addition of Jae Crowder might help with the defensive assignment of Kevin Durant, the addition of Isaiah Thomas spells even more trouble as the Cavs will have two players in Kevin Love and Isaiah who will have nowhere to hide against the Warriors. What do you think? Was this trade a win-win for both teams? Are the Celtics now the favourites in the East? Will the Cavs make it to their 4th straight finals? Let us know your thoughts via your comments on our Facebook, Twitter and Instagram posts. In anticipation of India’s first 3x3 Pro Basketball League, Gurugram to host ‘3x3 Road to Mexico’ this SeptemberYao Ming or Yao Meme?